Grab your lucky travel companion and get ready to experience the incredible sights and unique excursions that await you aboard the M.V. Fiji Princess. You'll get to witness the dramatic and beautiful shifts of the landscape, as you travel from the little palm-covered Mamanucas to the rugged, majestic southern Yasawa Islands. 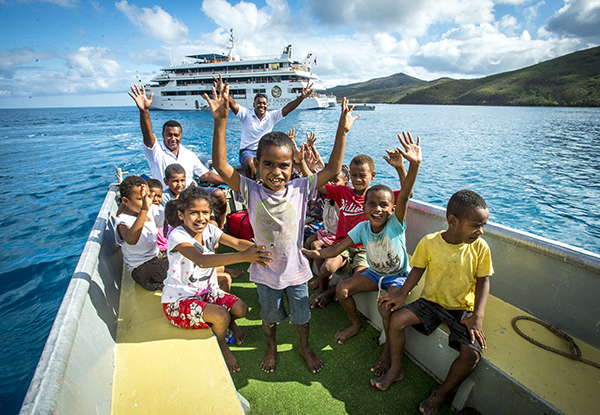 Experience a hands-on island life experience thanks to the unique Fijian style excursions. You'll get the chance to visit a remote Yasawa Island village, be part of a traditional kava ceremony, enjoy a meke performance and browse the village markets. Booking essential and must be made by 20th January 2019 for travel until 22nd February 2019. 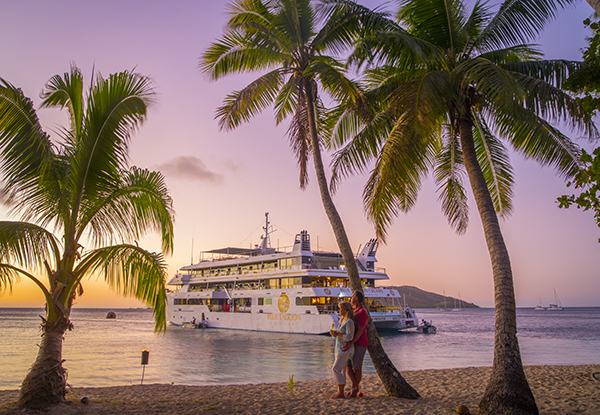 Grab a seven-night escape to paradise cruise for two-people including complimentary upgrade to an Orchid Cabin, meals and activities thanks to South Sea Cruises Limited. Set sail on the M.V. Fiji Princess from Port Denarau for the outer Mamanucas. The first overnight anchorage is Modriki Island, Tonight is the Captain’s Welcome dinner - an à la carte menu served in the dining saloon with entertainment provided by our talented singing, dancing, guitar-playing crew. 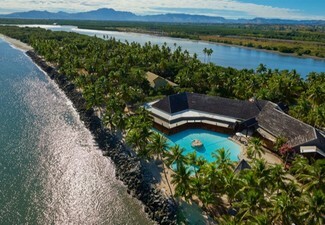 Sunday is a day of rest in Fiji. After breakfast you have the opportunity to attend a village church service, before cursing off to the beautiful Naukacuvu and Narara Islands as you enjoy a traditional Sunday roast lunch. Join the Chef for today’s Fijian cooking lesson and make the traditional dish ‘Kokoda’. Tonight’s buffet has a range of dishes from Fiji along with a choice of European dishes. There is Bingo ‘Fiji style’ after dinner with lots of laughs and some good prizes. Arrive at the stunning Sacred Isles, you'll be amazed by the backdrop of the neighbouring Waya Lailai volcanic formations. 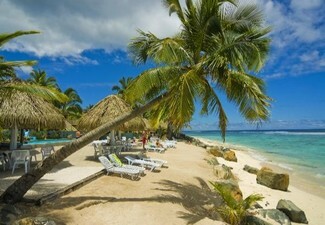 Spend the remainder of the day at your leisure, you can opt to go swimming, snorkelling or just relaxing. A high tea, Fiji style, is served following a cooking lesson on how to make ‘Roti in Lolo’. Watch the sunset and enjoy the Captain’s Welcome Dinner welcoming onboard the new 4-day cruise guest arrivals. underground, you’ll dine under the coconut palms and the tropical stars. 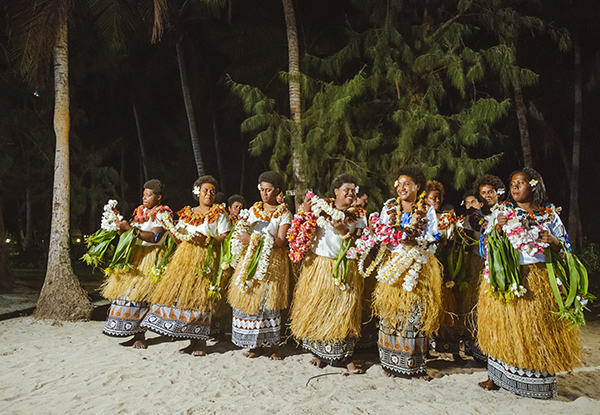 There will be Fijian meke: singing, dancing and story telling by local villagers. Enjoy a guided walk across the island to visit an island style cake shop and browse the shell market. This offers stunning panoramic views of the surrounding Islands, or choose to laze in the sun or try your hand at basket weaving. A guided snorkelling safari is also on offer today. Lunch is served on boardas we start to cruise north for aprivate guided visit to the amazing Sawa-I-Laucaves. The village ofTamasua greets the cruise with a yaqona ceremony, a guided walk around the village and then a village style ‘feast’ prepared and cooked by the village women. You will be a Fijian for the night, sitting on mats, eating Fijian village food. volunteer conservation work carried out in the area. During May to October you will have the opportunity to snorkel with the magnificent Manta rays. Also on offer today is an excursion to the local island school to view the work of the Vinaka Fiji Volunteers. Dinner this evening is a barbecue served under the stars before a party night, Fiji style. M.V. 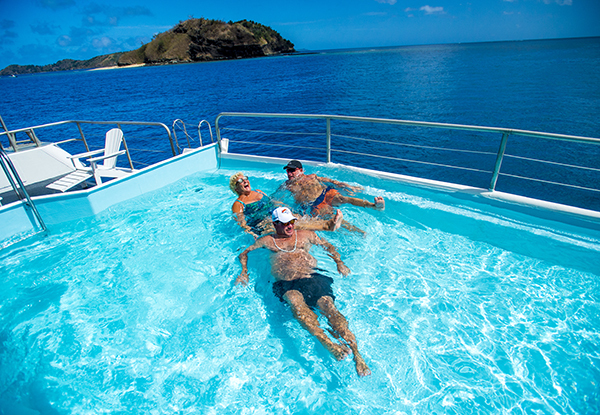 Fiji Princess: The beautiful 55m M/V Fiji Princess offers 34 high-standard cabins for up to 68 guests. 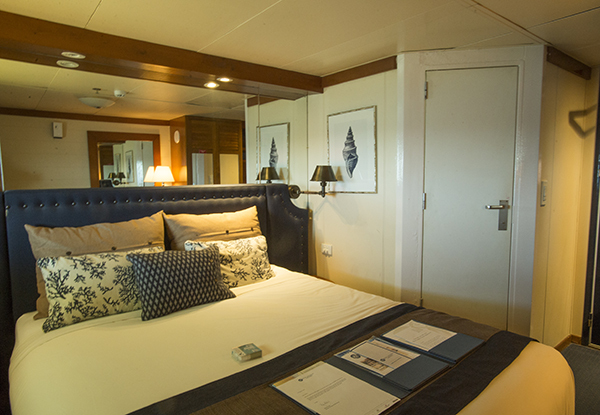 Each cabin is located above the waterline, and all have large windows offering beautiful ocean views. 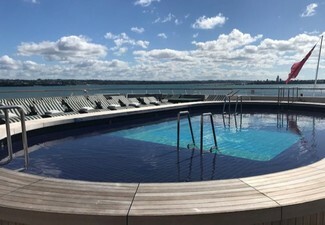 There is plenty of space to relax on board with sun loungers located on the upper sky-deck, the Senikai Spa offering a range of massage & beauty treatments, a small splash pool and shaded sky deck bar and salon bar. Meals are served in the open air dining room which offers spectacular ocean views. The onboard chef offers a variety of delicious dishes with a choice of local and international foods. The cabins also have ample storage space, AC, TV/DVD player, hair-dryer, towels and en-suite bathrooms with fragrant soaps. The Orchard cabins, located on the mid and upper decks also include a welcome fruit platter, daily stocked mini-bar (including bottled water, soft drinks, beer & wine), sun care pack and tea and coffee making facilities. Bookings essential and must be made by 20th January 2019. Subject to availability. 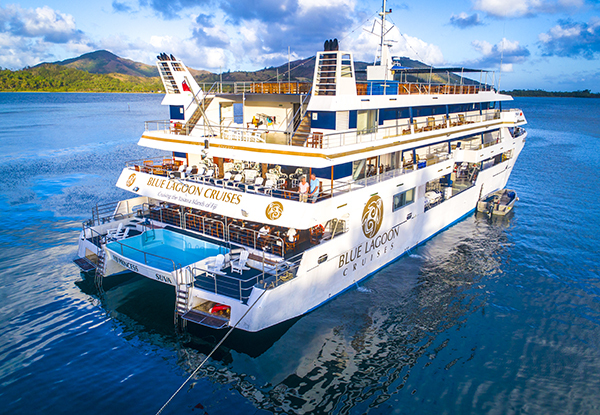 Cruise departs Port Denarau, Fiji on Fridays at 3.00pm. Valid departure dates include 7th & 14th December 2018, 4th, 11th January 2019 and 8th, 15th, 22nd February 2019. Flights not included. 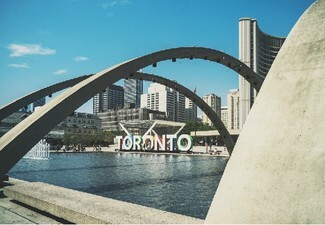 Valid for select 7-night departure dates only (subject to availability unless special fare and/or the departures are sold out prior to sale end date). Must be used in one visit. Deal valid for 2 people. Complimentary upgrade to an Orchid Cabin is subject to availability. Includes: Cruise accommodation with ensuite facilities, complimentary upgrade to an Orchid Cabin (subject to availability, use of onboard facilities, all scheduled cruise excursions and activities, all meals including tea, coffee, morning and afternoon tea, filtered water and juice, traditional Fijian entertainment, snorkelling equipment, use of all non-motorised watersports equipment at Nanuya Lailai, including stand-up paddleboards and kayaks, ship-to-shore transfers. 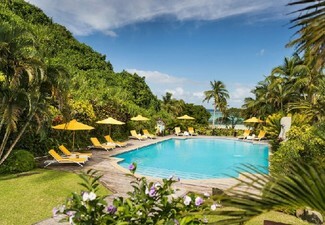 entrance fees for all activities and village visits, captain’s complimentary champagne cocktail, blue Lagoon Cruise souvenir, all port charges and taxes. Visas are the responsibility of the traveller. Excludes flights, personal travel insurance & anything not specifically mentioned in the inclusions. This promotion is valid for Grabone only. Travel insurance is recommended. Value of deal is based on current rates, which are subject to change. 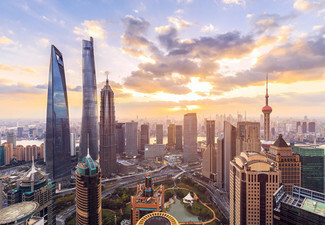 Due to the specific date of departure for this deal, once you have received the GrabOne email confirming your purchase, this purchase is not refundable unless required by law. No cashback. Not to be used with other offers.